If you live in a busy city or noisy neighborhood, it can be difficult to tune out the din and fall asleep. Roommates that keep different schedules than you or a partner who is a night owl also makes sleeping frustrating. A white noise machine can solve all of those problems and let you rest peacefully. Here we are going to take a look at some of the best white noise machines. What Exactly Is A White Noise? Have you ever been flipping through the channels on your TV and you get to one that is all black and white static. The sound of waves or blowing wind that accompanies that dead channel is white noise. White noise is created when different sounds of all different frequencies are combined together. It’s essentially all 20,000 sounds smashed together into one noise. It is described as “white” noise because of the way that light works. A white light is the combination of all colors of light on the prism, and white noise works in the same way just with sound instead of light. So What Does A White Noise Machine Do? A white noise machine is used to create this ambient sound and help mask or drown out other noises. Because white noise is a combination of all frequencies of sounds at once, it is able to hide other possibly disturbing or annoying sounds. White noise machines will often use the sound of wind or water to mask disturbances, but you can find other noises that work as well. Some have the sounds of nature or gentle music and a few machines will come with multiple discs that you can change to find a noise that helps you sleep better. Why Do I Want A White Noise Machine? 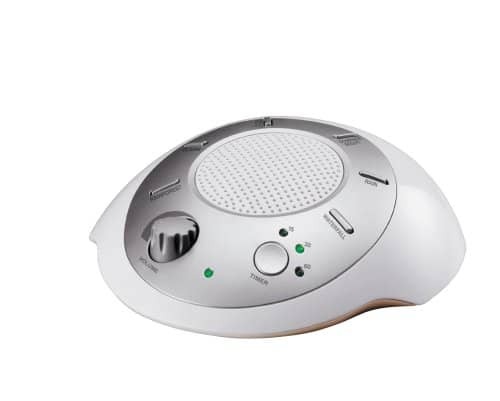 There a quite a few benefits to using a white noise machine at night and all of them are worth considering when you are thinking of purchasing a white noise machine. For some people, falling asleep is no easy task. It can take hours just to drift off to sleep and by that point you worry that you are going to oversleep and miss your alarm. A white noise machine can help you fall asleep faster. It will drown out any possibly distracting noises creating an atmosphere that is ideal for a peaceful sleep. It’s also nice because it can be customized to your personal preference. Maybe you fall asleep just fine, but you constantly wake up throughout the night. If you are a light sleeper a white noise machine can be your key to sleeping through the night. Many people think that white noise machines use a placebo effect to stay asleep, so just knowing that you have the machine on helps keep you asleep. But there has actually been research that shows white noise machines are more than just placebos. Our brain constantly craves sensory input, even while you are asleep. Because you aren’t giving your brain any input while you sleep, it will latch on to extraneous noises like a car alarm or loud neighbors activate itself. A white noise machine takes the place of outside noises and drowns them out while simultaneously giving your brain the sensory input that it desires. Besides allowing you to fall and stay asleep, a white noise machine can be used in other situations. If you work from home and are frequently distracted by outside noises a white noise machine can help create an ambient atmosphere that will allow you to focus on the task at hand. It can also be great for children, both young and older. For older kids, a white noise machine can be helpful when they are working on homework. It is better than turning on the TV as background noise because it won’t distract them while they work. White noise machines are also great for babies. Babies sleep more frequently than adults as well as throughout the day. If you have older kids in the house, they can cause loud noises that will keep your baby from getting a good nap. A white noise machine in the baby’s room can help to block out the noise from the rest of the house while they are napping. Do I Have To Get A White Noise Machine With Only One Sound? The most common sound that a white noise machine will emit is what sounds like blowing wind or crashing waves. This sound works for some people, but others find this noise just as distracting as a car alarm. Fortunately, you can find plenty of white noise machines that have different sounds to suit your needs. This is another popular sound for white noise machines. You can find the sounds of a rainforest, the chirping of crickets, or the sound of a waterfall. If these sounds are more soothing to you than traditional white noise, then make sure to find a machine that uses these instead. Regular music might not help you fall asleep, but some white noise machines will use instrumental music to create a soothing atmosphere. Music with the soft and repetitive beating of drums or wooden flute songs can be soothing without being distracting like regular music. You might also be able to find a few machines that will use ambient chanting or tribal music. A white noise machine doesn’t have to be an extremely expensive purchase. You can find some great models that are $20 to $30. If you want to have more bells and whistles, you can pay up to $70. The more expensive machines will often have multiple sounds that you can use, have clocks, and may even be able to travel. All you have to do is decide what you need in a white noise machine and find a model that fits into your budget. The Homedics Sound Spa Relaxation Machine comes with a traditional white noise function as well as five other nature sounds. You can choose from the ocean, summer night, rain, thunder, and a brook to find a noise that works for you. It also has a timer function that is really nice if you don’t want it playing the whole night. You can set it to turn off after 15, 30, or 60 minutes. Another nice feature of this machine is that it can be portable and travel with you. It also has a power adaptor, so if you want to plug it in you can do that as well. You will need to purchase four AA batteries to work the adaptor and the travel function. This white noise machine is the official noise machine of the National Sleep Foundation. There is only one sound on this machine and it uses a real fan to emit the sound of rushing air. The Marpac is also really easy to use and you can adjust the volume simply by twisting the cap. This machine is completely portable so you can take it with you wherever you go and it is small enough to make travel convenient. You can choose from four different colors to match your decor and you also have the option of getting a two-pack. The Marpac noise machine also offers a 1-year limited warranty. This noise machine has two different sounds that you can choose from. There are ten different fan sounds and ten different white noise sounds that are all good to drown out unwanted noises. You can get the LectroFan noise machine in two different colors, black and white, and you can also get a 2-pack. A great feature of this noise machine is that it can be powered by USB so if you travel you can use your computer to power the machine. It also comes with an AC adaptor so it is easy to use anywhere. The LectroFan has a 1-year manufacturer's warranty. 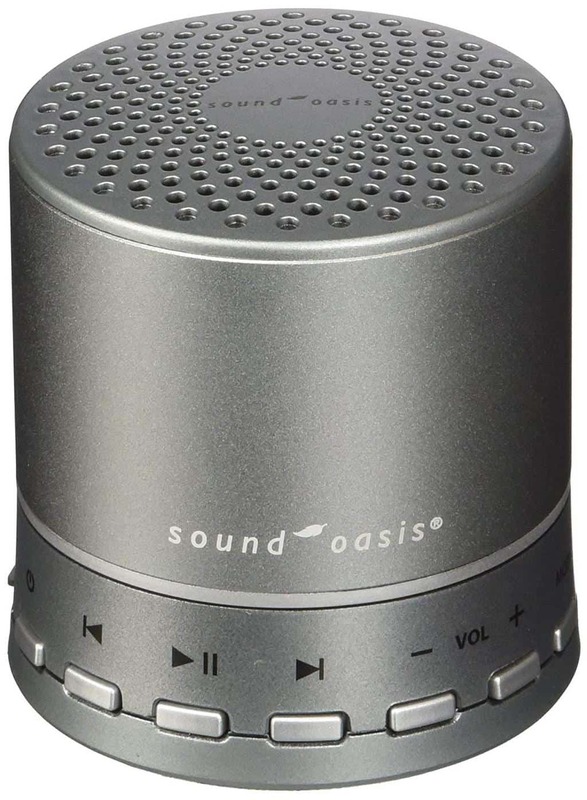 The Sound Oasis machine is actually three machines in one. It is a white noise machine, a Bluetooth wireless speaker, and a Bluetooth speakerphone. This machine is equipped with ten different relaxing nature sounds and you can also connect your smart device via Bluetooth to stream and play your own music. It is powered by a USB cord and it’s rechargeable so you can move it all over the house or even travel with it. When it is paired with your phone you can make hands-free phone calls and the Bluetooth has a range of 30 feet. The Ecotones sound machine is a unique noise machine that will adapt to your environment. You can choose from 10 different naturally recorded sounds. Each sound recording is strung together in a unique pattern so though sounds will never repeat and sound as natural as possible. This machine is also adaptive to your environment because it constantly listens to any noises outside and will adjust the level of its ambient noises so that you won’t wake up by a distracting sound. It also has a timer so you can have the machine turn off while you’re sleeping. The Sound + Sleep machine has a 30-day return policy and a one-year warranty.